PanARMENIAN.Net - Russian Defense Minister Sergei Shoigu has thanked his Armenian counterpart David Tonoyan for participating in providing humanitarian aid to Syria. 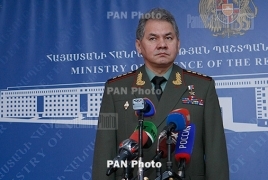 At a meeting in Moscow on Friday, February 8, Shoigu said Armenia was the first to respond to Russia's call for assistance to the Syrian people. He said the mission was especially important for Syrian children who have not had a peaceful life for a long time and have been deprived of school for five to seven years. Tonoyan too thanked the Russian side for assistance in Syria. According to the head of the Armenian Ministry of Defense, Russia's activity in Syria benefits the post-conflict reconstruction of the war-torn country. A group of Armenian humanitarian demining experts, medical personnel and specialists ensuring the safety of the entire group - a total of 83 people - traveled to Aleppo, Syria on Friday, February 8 to provide humanitarian assistance to the Syrian people, Defense Ministry spokesman Artsrun Hovhannisyan said in a Facebook post. According to him, Armenian specialists will carry out humanitarian activities related to demining, mine awareness among the population, provision of medical assistance in Aleppo exclusively outside the zone of combat operations.